Tuesday, November 6 was a historic night for elections both in Swarthmore and across the country due to upsets and voter turnout, the latter of which was considerably higher from Swarthmore students than in 2014. 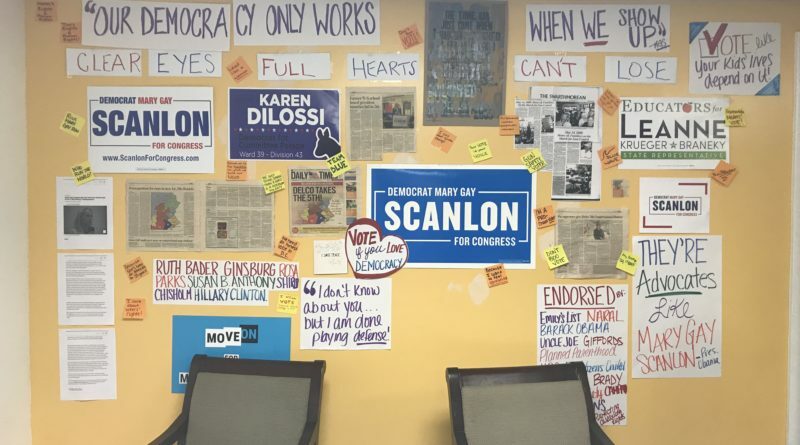 On the national level, Democrats won back the U.S. House of Representatives with one of those seats being Mary Gay Scanlon’s, a Swarthmore resident who won a newly-redistricted seat. Due to a couple of key wins, Republicans managed to hold onto the U.S. Senate. With a Get Out the Vote committee, food truck, flyers across campus and chalk reading Remember Nov 9, 2016?, there was much emphasis on student voting prior to Tuesday. According to Emily Weisgrau, chair of the Get Out the Vote committee, the number of students who took the vans in 2018 is roughly equal to the total number of students who voted by any means in the midterms elections in 2014 — about 200 students. This signals a large increase in participation over the 2014 elections, in which 84 students used the vans. The dataset does not include how many students took alternative transportation to the polls or how many voted absentee in 2018. Despite the rain, there appeared to be a steady flow of students using the college-provided vans throughout the day. Some students noted that officials at the polling place said that voter turnout was the highest they’d seen. Dana Homer ’21, who walked to her polling place, was impressed with voter turnout. “There was already a line, which is good because it means high turnout,” she said. Across the country, 113 million people voted in the midterm elections (about 49 percent of eligible voters), which is the first time over 100 million people have voted in the midterms. Democrats won all the Pennsylvania races that Swarthmore students voted in. In the race for State House in the 161st district, incumbent Leanne Krueger-Braneky (D) beat her Republican challenger, Patti Rodgers Morrisette. In a tightly contested race for State Senate, Tim Kearney, the mayor of Swarthmore, upset Republican incumbent Tom McGarrigle. According to the Delco Times, Kearney, who was called an “elitist liberal professor” during the campaign, received 54,027 votes while McGarrigle got 46,963. Mary Gay Scanlon (D) won the U.S. House of Representatives election for the 5th district, which now includes Swarthmore. She won with 65 percent of the vote, and her opponent, Pearl Kim (R), received 35 percent. Her supporters were featured on ABC’s national broadcast, which had a reporter at the Inn at Swarthmore, where her campaign was gathered for election night. 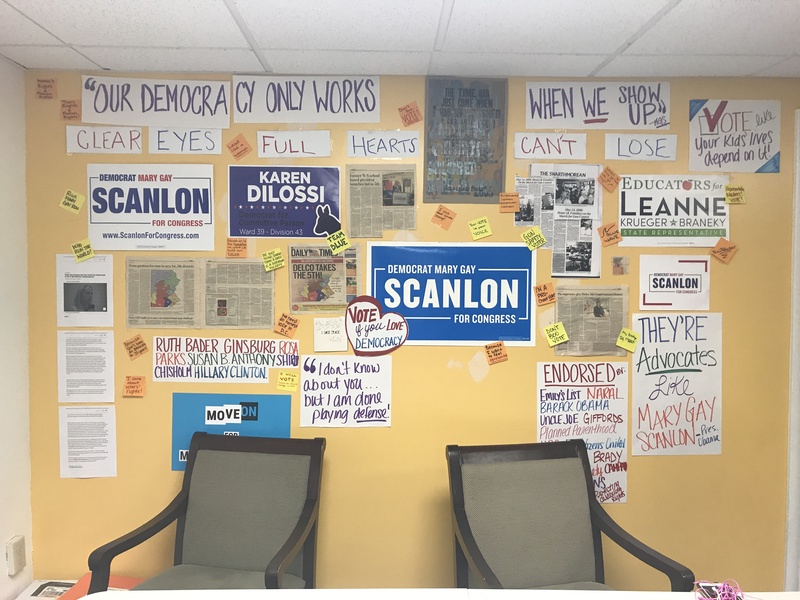 Scanlon, the first congresswoman from Delaware County, is one of four women who won House races in Pennsylvania, victories which have changed the previously all-male group of representatives. For the U.S. Senate, incumbent Democrat Bob Casey retained his seat with 55.6 percent of the vote while Republican challenger Lou Barletta got 42.8 percent. Barletta has closely allied himself with President Trump, who won Pennsylvania in 2016. Dale Kerns, the candidate from the Libertarian Party, received 1 percent, and Neal Gale, the Green Party candidate, received 0.6 percent. In the gubernatorial race, incumbent Democrat Tom Wolf kept his position. He received 2,832,955 votes and beat his closest challenger, Republican Scott Wagner, with 57.6 percent compared to 40.8 percent. In a controversial video last month, Wagner threatened to “stomp all over” Wolf with golf spikes. Wagner later apologized. Significant Democratic wins in Swarthmore and other parts of Pennsylvania were a trend in U.S. House races. At the watch party at the Women’s Resource Center, races across the country were also of great interest. There, students watched in interest to see how many House seats would switch to Democrat. There were cheers for Democratic winners such as Conor Lamb from Pennsylvania’s 17th district as well as frustration towards prominent Republican figures such as Press Secretary Sarah Huckabee Sanders and Ted Cruz. An early race that disappointed Democrats was in Tennessee when Marsha Blackburn, an outspoken ally of President Trump, beat former Tennessee governor Phil Bredesen by a significant margin (54.7 percent to 43.9 percent). Another race that drew national attention and the attention of watch-party attendees was Democrat Beto O’Rourke’s challenge against Republican Ted Cruz for Texas senator. Ultimately, Cruz won the election with 52 percent of the vote compared to O’Rourke’s 43 percent. Cruz’s win, as well as Democrat Heidi Heitkamp’s significant loss to Republican Kevin Cramer in North Dakota helped the Republicans keep control of the Senate. The reporting of these results was also met with disappointment at the watch party, especially after O’Rourke seemed to have an early lead. In the gubernatorial race in Florida, Republican Ron DeSantis is projected to win over Democrat Andrew Gillum by a narrow margin. With 99 percent of precincts reporting, DeSantis has 4,056,393 (49.7 percent) votes while Gillum has 4,008,435 votes (49.1 percent). Another potentially history-making gubernatorial race in Georgia has not concluded, as Democrat Stacey Abrams has not yet conceded to Republican Brian Kemp, saying that many votes have yet to be counted and “voices are waiting to be heard.” This particular race has been shrouded in accusations of voter suppression due polling places closing in predominantly black counties. Kemp, the Georgia Secretary of State, is in charge of overseeing voting. Currently, Kemp has 1,972,953 votes (50.3 percent), and Abrams has 1,909,838 votes (48.7 percent). If no candidate has more than 50 percent after they are all counted, there will be a runoff election in December. Despite potential losses for Democrats in the two close gubernatorial races in the South, in Wisconsin, Democrat challenger Tony Evers unseated incumbent Republican governor Scott Walker. Evers garnered 49.6 percent of the vote compared to Walker’s 48.4 percent. Tuesday night was also a big night for two Swarthmore alumni who won their elections. Phil Weiser ’90 won Colorado attorney general, and Josh Green ’92 won the position of lieutenant governor of Hawaii, running with incumbent David Ige. Ige and Green won over 60 percent of the vote. Both Weiser and Green ran as Democrats.